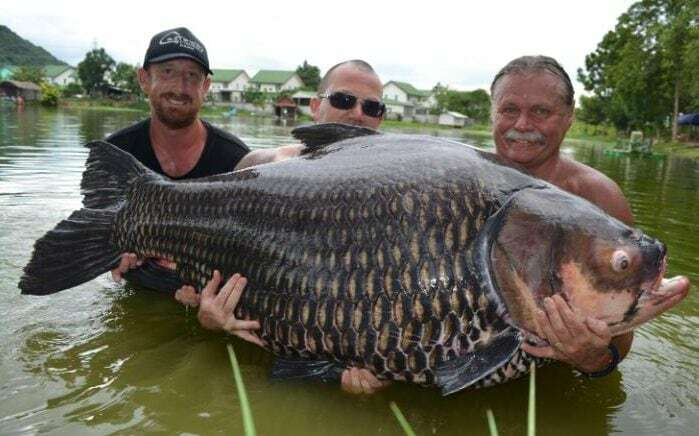 A British man has managed to catch the world's largest carp. Tim Webb, 57, landed the 222lb giant Siamese carp after an exhausting 90-minute battle at a lake in Ban Pong, Thailand. Mr Webb, from Crawley, West Sussex, owns his own fishery in Thailand and is a keen angler. All it took to lure the greedy fish onto his line was a simple bait of bread and bran rice. The angler almost lost the beast, and during the grueling battle he thought a couple of times that he had lost. However, patience and perseverance meant he managed to land the beast. The hard work paid off - when weighed, the carp was found to be almost 16 stone. This easily beat the previous record for a Siamese carp - the previous record-holder was a comparatively puny 150lbs. In order to get a picture with his prize, he had to enlist the help of two fellow anglers to hold up the fish. Because he was so enamoured with the large fish, he bought it from the lake and released it into his own fishery 25 miles away. He had to ask six people to help him lift the carp into the back of his truck. Tim said: "It's an amazing feeling to reel in a fish that is well over the world record. "As soon as I felt it on the end of my line I knew I had something special. "I had to fight it hard for a long time because in effect I was reeling in a small car. "There were one or two hairy moments but I managed to bring it to the bank. I was elated but shattered afterwards." He added: "It was amazing to actually take it away with me and put it in my own lake. "Having a fish of that size generates a lot of interest, people will want to come and have a go at trying to catch it." Siamese cap, found in river basins in Asia, are the biggest species in the world.